I hope you all had an amazing weekend. We had an action packed weekend here in NY. One day of fun and one day of work! On Saturday we had a fuzzin wedding to attend. Of course I had minor freak out over what I was going to wear. I had plans to run out early Saturday morning and search for a new dress at Nordstrom Rack, but apparently my body had other plans. I didn't wake up till 10:30 am and then after cleaning up the house a bit I knew it was way too late to get ready and make it out to find something new. So I became an outfit repeater (Anyone know what movie that term comes from? Totally ashamed I've seen this movie. :) ) and wore the same dress I wore to Mom and Dad's vow renewal. I changed it up a bit and added some vintage earrings that added a punch of color and sparkle, but also pain. They were clip on's and they hurt! One of the only shots I got of the bride and groom. They looked great. I can't wait to see their professional shots, because mine didn't come out so hot. 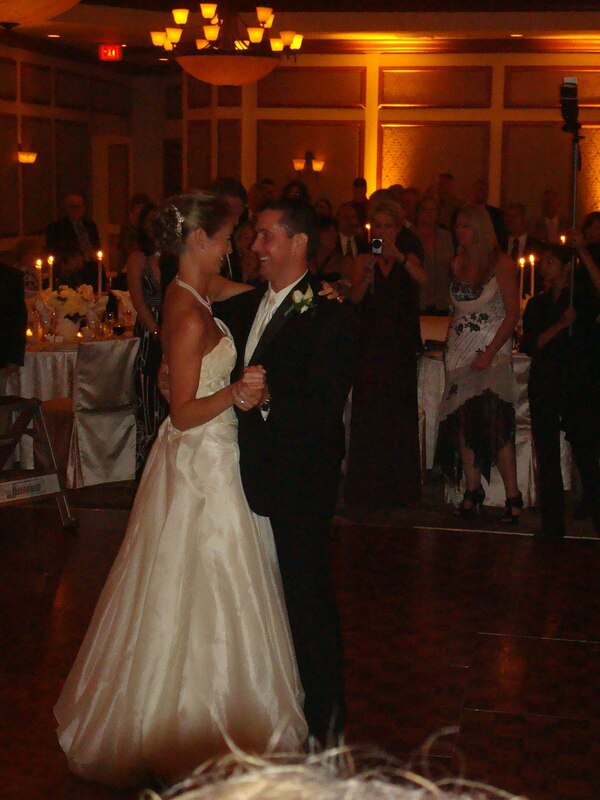 We danced the night away and then headed back home to get some rest, because I had big plans for Sunday. 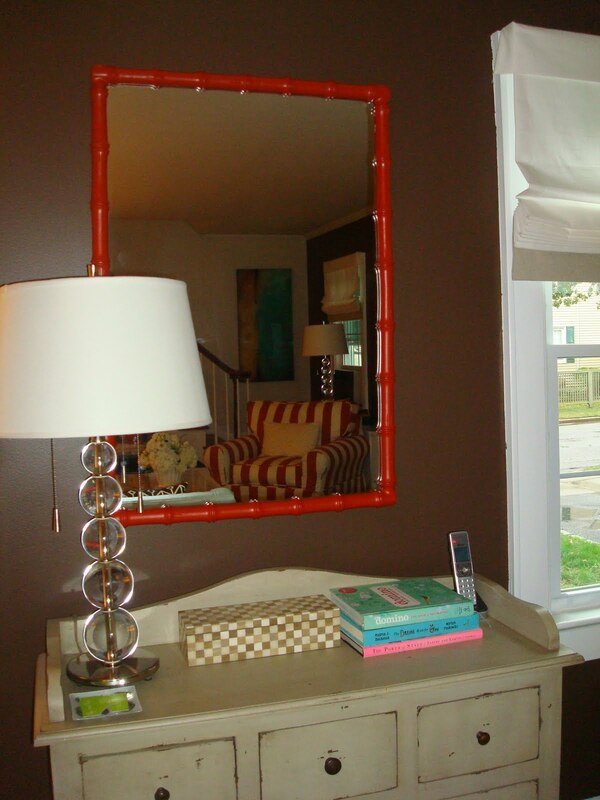 Plus a vintage bamboo mirror was giving a coat of orangey/red spray paint and hung up for all to enjoy. The larger mirror makes a huge difference. It really opened up the space! 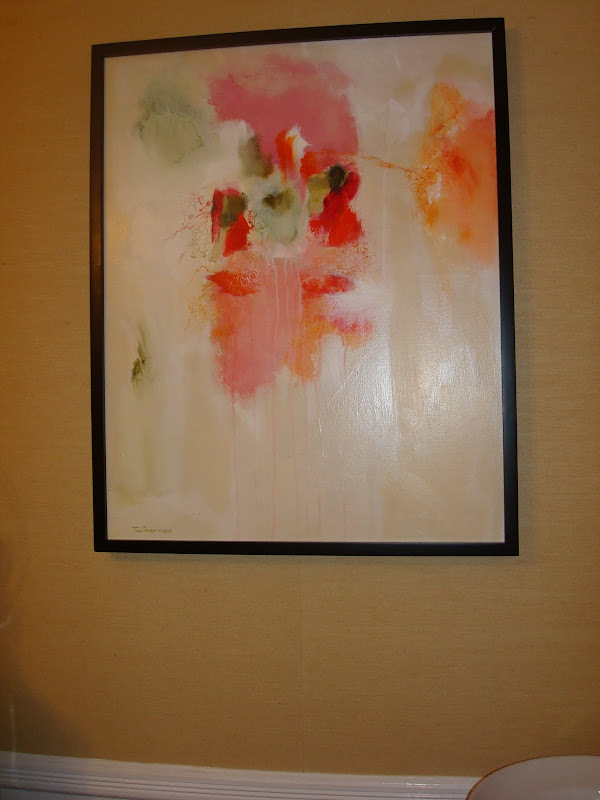 Hung stunning artwork that I will treasure forever! It is by the amazingly talented Tina Steele Lindsey a wonderful artist based out of Atlanta. What were you up to this weekend? Any fun projects you took on? I adore Lindsay's art! The pillows are wonderful with the new drapes. Where did you find them (the pillows)!? Wow! The window treatments looks so great! I am always worried about being a repeat offender but I don't really think anyone notices! It's a beautiful dress...might as well get some use out of it! Can't wait to see your portfolio shots...your home is looking great! Everything looks great ! I was going to say I did absolutely nothing this weekend, then I remembered I did a cornice on Saturday. I need a nap in that window seat after reading all that you did in a weekend! Looks great! Sounds like a great weekend! I love the look of your living room, espec. the window treatments and the bamboo mirror! This weekend I went to an antique fair where I picked up a Dorothy Draper Espana chest for $100 (I think it's a knock off but still a good price). Gorgeous painting and I adore the mirror!! Love the pillows and the art. The mirror looks great against the brown wall. Love your chair in the living room. Can I ask where it is from? I am looking to add two chairs to our living room. We just bought a huge sofa that will be recovered once I figure out the chair situation. Thanks for all the sweet comments. Totally makes me day especially during such a dreary day like the one we are having today in NY. They are so well made and one of the most reasonably priced pillow sellers on etsy that I've found. Love them! I love them and the store always has some sort of 15-20 % off promo code going on. They are based in NC so I didn't sit on them before hand, but they give a 30 showroom trial so you can test them out in your home and see if you like them. If you don't they will come back and pick them and give you a full refund. Pretty cool. We bought out sofa from them as well. Where are your white roman shades from? Are they custom or did you pick them up from a store? They look great. Love the crisp white. Which brown do you have in your living room? I tried a Benjamin Moore Grizzly Bear brown...I like yours better. Thanks for the info on the chairs! oh wow, it looks realllllly great! I love it. i want to see your whole house!! Lindsay's piece is GORGEOUS! may I ask where one can purchase a print or original? Your window treatments are dreamy. And the brown pillow's print is to die for! you house is looking so amazing. love the new pillows and mirror! love that piece! i'll have to check her out! sounds like y'all had a busy weekend! It looks beautiful! 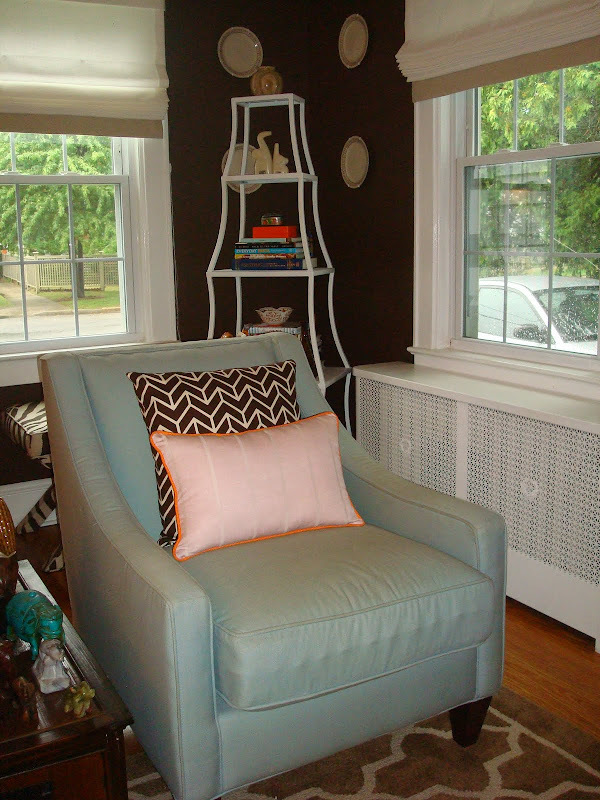 Where did you get your beautiful etagere? I have been searching for an affordable version of that same one in a neutral color!